A Diamond Select Toys Release. Getting over a bad break-up or an unsuccessful hit? 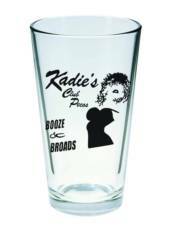 What better way to drown your sorrows than in a pint glass emblazoned with the logo of Kadie's Club Pecos? Just the sight of the Kadie's logo (plus whatever's in your glass) is enough to cheer the sorriest soul. Comes packaged in a full-color box.